By eliminating hops, brewers can make a more sustainable product. But are consumers ready for bioengineered beer? C	C	raft beer is big business. One out of every eight beers sold in the United States in 2016 was a craft beer, defined as beer made using traditional fermentation methods by relatively small, independent breweries. But the explosive popularity of craft beer has also driven up demand for hops, the dried flower of a weed-like climbing plant that gives many craft beers their brightly bitter, citrusy flavor. Popular craft beer varieties like India Pale Ale use six times as many hops per volume than conventional lagers. Not only has the skyrocketing demand for hops affected the crop’s price — nearly doubling from $2.99 a pound in 2007 to $5.92 a pound in 2017 — but it’s also putting a strain on the environment. A thirsty hop field soaks up 50 pints of water for every pint of craft beer. Now a team of beer-loving scientists from the University of California, Berkeley believes they’ve discovered a way to brew hop-heavy craft beers without sacrificing sustainability. 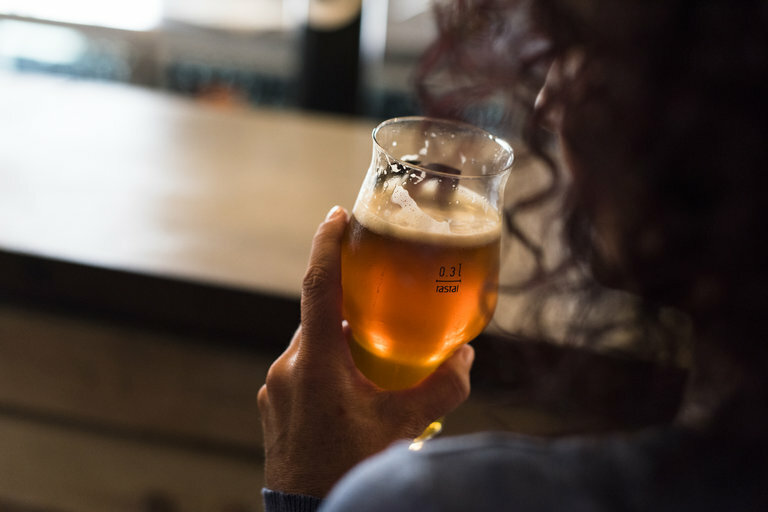 The researchers used the genome-editing tool CRISPR-CAS9 to engineer a strain of brewer’s yeast that recreates hops’ unique flavor without using any actual hops, according to an article published in Nature Communications. Charles Denby is a biochemist at UC Berkeley, co-first author of the paper, and founder of Berkeley Brewing Science, a beer startup that hopes to offer breweries a more sustainable way to brew hop-forward craft beers using genetically engineered yeast. Denby told Seeker that he stumbled into brewing science through a combination of his Ph.D. research into sustainable biofuels and a weekend home-brewing hobby. He did his postdoctoral work in the lab of Jay Keasling, a pioneer of engineering microbes that consume renewable feedstock and spit out useful chemicals like diesel fuel or fragrance molecules for the cosmetics industry. Reading up on the chemistry of hops, Denby figured out that the flavor molecules that give hops their grapefruity taste belong to the same class of molecules, known as terpenes, that he was already producing in Keasling’s lab. “When you open a bottle of craft beer, or pour it from a tap, these terpene molecules will volatilize and hit your nose and hit your palette, and that’s why they impart such strong flavors,” said Denby. Two terpene molecules in particular are found in abundance in the essential oils that give hops their zesty, bitter taste: linalool and geraniol. With his bioengineering experience, Denby knew that it was possible, though difficult, to isolate the genes that code for those two flavor molecules and insert them into brewer’s yeast, the microbe responsible for fermenting barley into beer. Denby couldn’t steal the genes directly from hops, because plant geneticists don’t know which snippets of hops DNA code for those flavor molecules. Instead, he and his research partner Rachel Li copied genes from mint and basil that encode for the enzymes that produce linalool and geraniol. Denby and Li didn’t just engineer one strain of hoppy yeast. They created 48 different varieties, each with a different combination of promoters that activated the enzymes at different levels and different times in the fermentation process. They then brewed 48 tiny test batches of beer to measure the amount of the flavor molecules in the final product. Once they picked the four top varieties, it was time for the taste test. “That was a really surprising and fun finding,” said Denby. Denby’s startup, Berkeley Brewing Science, is busy developing more flavor combinations that can be engineered into common brewer’s yeast. But Denby acknowledges that consumers who are already wary of genetically modified foods might be hesitant to embrace a bioengineered beverage. Denby also points to studies showing that Millennials who understand biotechnology are more willing than the general population to purchase GM foods and beverages. Maybe they just need to call it Save the Planet IPA.